Our Healthier Gingerbread Houses were great for both of my girls to eat, but much more fun for my three-year-old to make than it was for my “baby” (16 months). 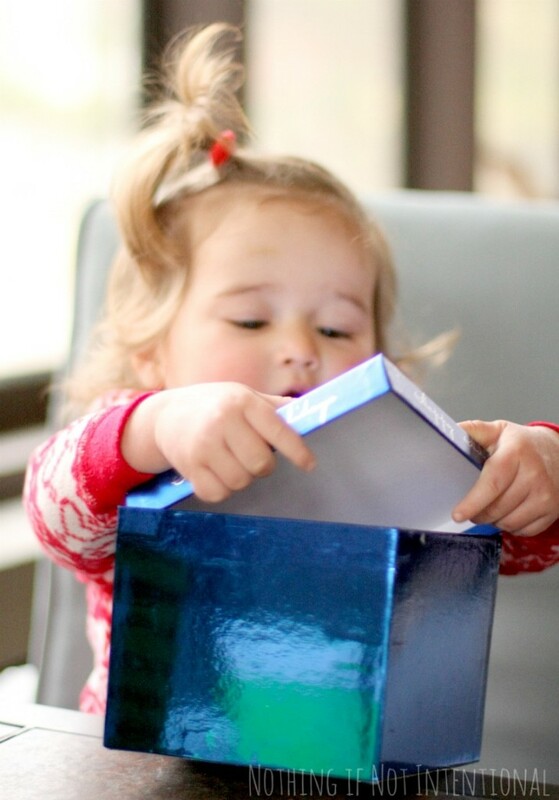 This time, I wanted to share a Christmas play idea that is perfect for our little toddling, baby friends. Nate loves giving our girls random household objects to play with. (“Here–have a whisk! What’s that? You need a tunnel for your cars? Take a toilet paper roll!”) There’s a fancy name for this type of thing–heuristic play. 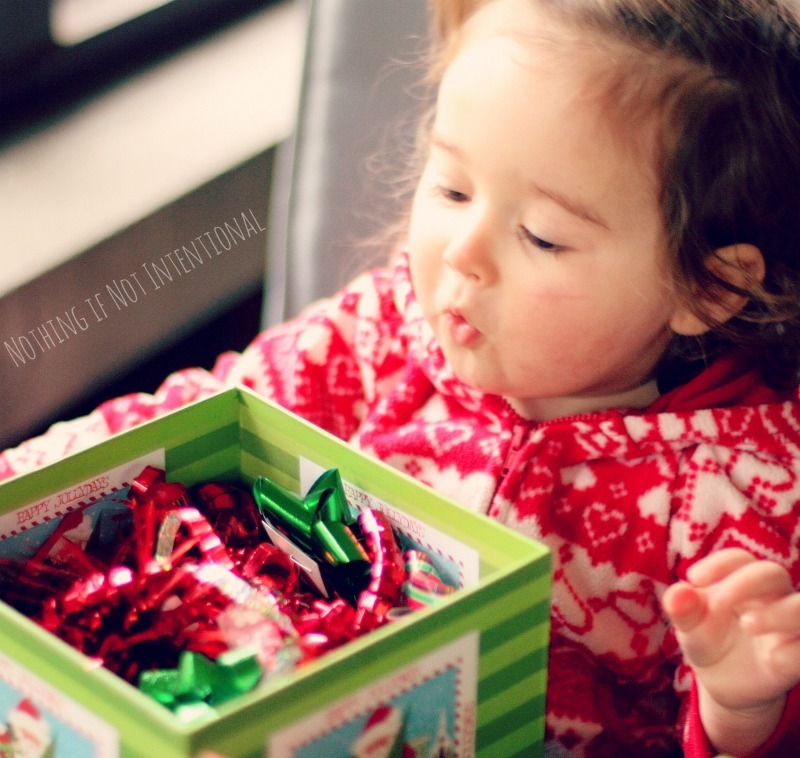 You can read more about heuristic play and get more ideas for year-round discovery boxes here and here. 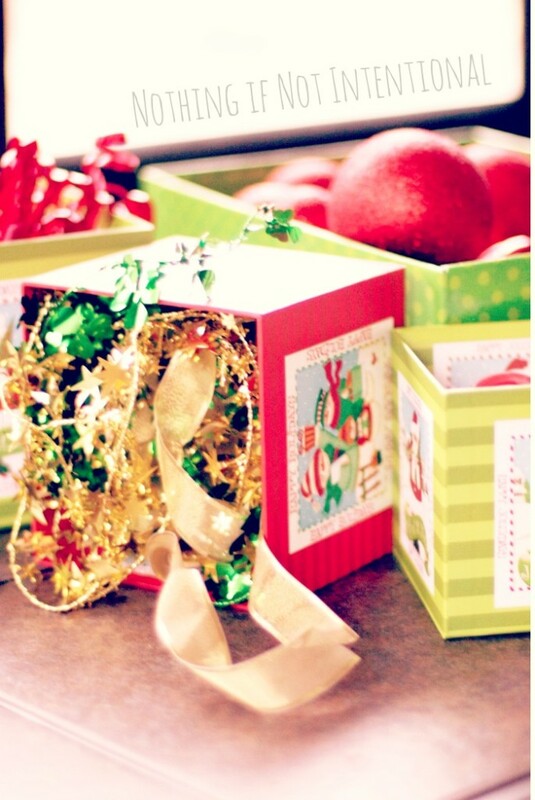 My friend Melissa (a preschool teacher) had the brilliant idea to take nesting gift boxes (like these) and turn them into Christmas discovery boxes. My 16-month-old loved pulling open the lids. And checking out the goodies. The jingle bells were a hit. I’ve left these boxes under the Christmas tree, and my little one keeps coming back to them over and over and over again. Her favorite thing to do is to transfer the balls from one box to another. What do you expect your child to gravitate towards? Common sense warning: as always, please supervise and use discretion! Some of these small parts may not be suitable for your child. Our Christmas Play Days series wraps up on Thursday. My third and final post will allow me to cross an important item off our Christmas Bucket List! To make sure you don’t miss it, follow our blog on pinterest, subscribe by email (using the box in the upper, right-hand side of the blog), and/or join the conversation on the Nothing if Not Intentional facebook page! Before you go, check out the other awesome posts from the bloggers participating in the Christmas Play Days series! Holiday Breakfast Train by Play Trains! 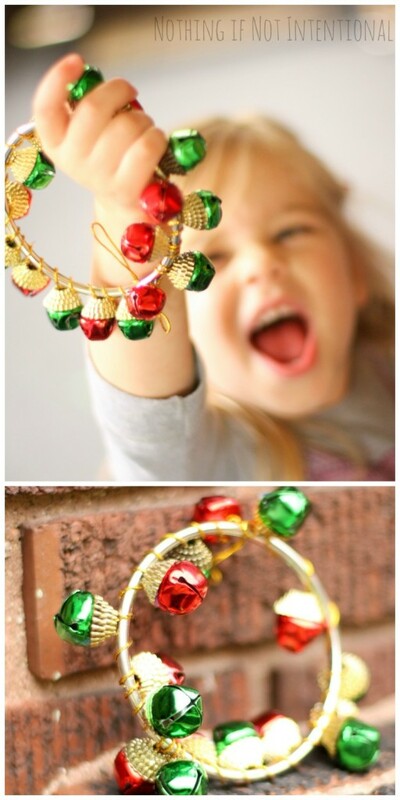 Fine Motor Christmas Trees by Fun-A-Day! ← Gingerbread house decorating makeover! All the fun without the sugar crash. 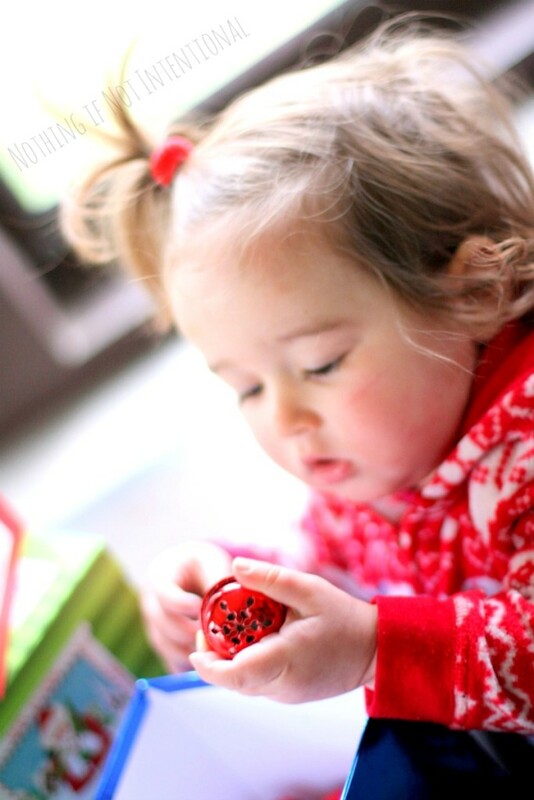 Pingback: Fine Motor Christmas Trees - Holiday Fun for Little Hands - Fun-A-Day! 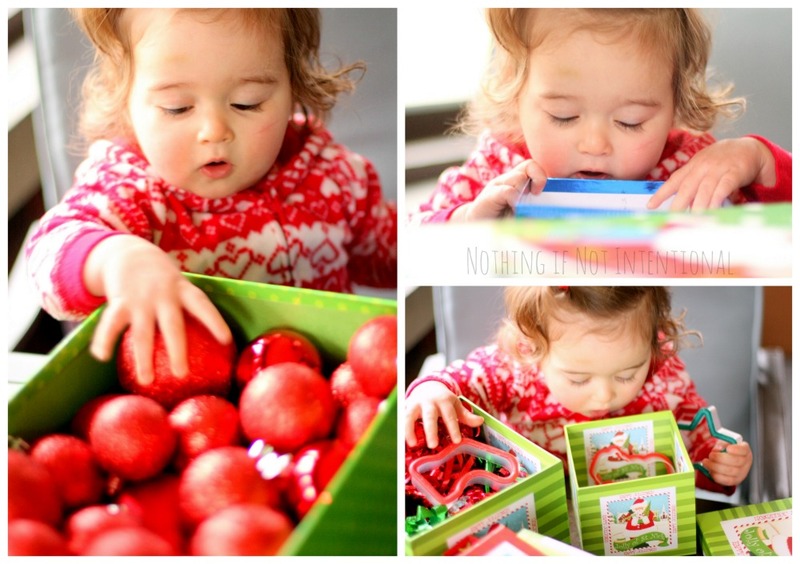 Pingback: Make the House Smell Like Christmas: A *Sensational* Holiday Activity for Kids.